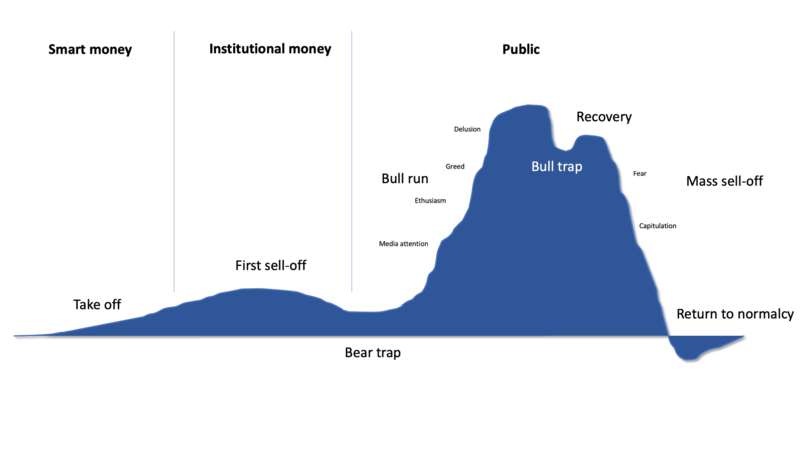 what defines a 'Bull run'? A bull run is perceptible through an overwhelmingly positive market sentiment. Such periods are determined by a fast increase of prices due to optimistic expectations and new investors entering the space. In the past we observed that factors like speculation and psychology played a decisive role in the emergence of bull runs. During such periods the market often develops its own dynamics with a mixture out of exaggerating optimism, greed and unrealistic expectations. The media often reinforces this dynamic, trying to satisfy the need of information. We can assume that the media of the 21st century often substantially contributes to unrealistic price expectations of investors, pushing the prices on even higher levels. If prices begin to fall, it is often the beginning of the end. As new entrants entered the space with unrealistic expectations they are considered to be “weak hands”. This means they will sell-off their position as soon as the price drops. The only reason they invested was to make a quick buck over night. When bull runs are coming to an end they often lead into periods characterized by a negative market sentiment, so-called bear markets. The most recent example of a bull run in cryptocurrencies was rally of Bitcoins from November 2017 – January 2018. Bitcoins all-time high has climbed to nearly 20’000 USD while the overall market capitalization went over 800 billion USD. During the massive price explosion, we could observe many of the factors named in the previous paragraph. On one hand Fox News and his fellows daily reported about Bitcoins price developments. On the other hand a plethora of new investors made their way into cryptocurrencies as apparently everybody was knowing what Bitcoin and Blockchain is. Not only that, we could also see a massive run up on the supply side. ICOs (Initial Coin Offerings) were the new hit of 2017. Everybody was launching its own Blockchain as funding was easier when demand was high. Dubious projects launched ICOs as international regulation was no deployed yet. For this reason nonserious projects were getting funded by millions of USD of ignorant, greedy investors who though they would just have made the investment of their live. From October 2017 until January 2018 even those projects have multiplied their value several times. At this point smart investors realized how overvalued the market was. As always, reality cached-up following a massive crash, were Bitcoin has lost over 2/3 of its all-time high value.